For those of you with pets, here’s an experiment. Try feeding them just once this year. Before you call PETA, hear me out. 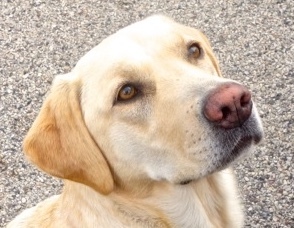 Our yellow lab “Breeze” moves into the kitchen around dinner time and lays her head down, perfectly portraying the pity of a dog needing her food. And each night right around 6 p.m., she gets her food. Why? Because if she didn’t, she would cease to exist. When we “feed” something, we nourish it, or supply it with what is necessary for life, health and growth. Feeding a pet once a year is a ridiculous concept. Feeding a business once a year is the norm. It generally happens during the strategic planning process, if at all. Even then, only a handful of people are actively involved in looking at new ideas and using them to build a plan. What do we need to feed a business? What are the elements that nourish the business, ensuring it’s healthy and growing? Here are three nutritious ingredients of any good business diet. An insight is when you’re able to combine two or more pieces of information or data into a new solution, new offering or new approach to creating and delivering value. A study of more than 5,000 executives showed that the most important innovation trait for managers in high-performing organizations is the ability to come up with insights. Unfortunately, only 35 percent of managers believe their strategies are built on unique insights. This is a big reason that so many products and services devolve into “me-too” offerings with no differentiation and are left to battle it out on price. Insights are all around us. What we need to identify them is an awareness of what they are, how to generate them, a convenient place to record them and effective channels for sharing with others. Great leaders don’t have all the answers, but they understand how to tap into their people’s insights on a regular basis to shed light on those answers. Diet: Create an Insight Network. I’ve helped a number of Fortune 500 companies develop an Insight Network without adding any new technology costs. We map out the different players in the organization, their connections with customers and competitors and potential channels for insights. Once the map is complete and the process is in place, it’s a matter of educating employees on what insights are, how to collect and share them and most important, how to use them to help achieve goals and objectives. 2. New conversations. A question I often pose to executives that I’m coaching is, “How many new people have you had a conversation with this month?” I’m not talking about those rambling teleconferences that wander into the hinterlands of business hysteria like Leonardo DiCaprio’s character Hugh Glass in “The Revenant.” I’m talking about engaging colleagues in different functional areas of the business on a periodic basis to gain their perspectives and insights. The sad fact is that many meetings are nothing more than serial monologues framed by the glow of PowerPoint slides. Real conversations include open dialogue about the key business issues with no predetermined outcome. These open exchange of ideas feed great companies. Diet: New insights for your business are often old ideas in other parts of the business. Seek out one person from a different functional area or level to have a business conversation with each month to stimulate your thinking. When it comes to your district, regional or national meetings, provide people with plenty of time to have both formal and informal conversations about the business. When I lead strategic thinking workshops at conferences, my rule of thumb is 20 percent presentation and 80 percent facilitated conversation. 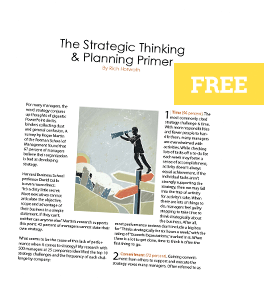 The majority of organizations have those percentages flip-flopped and it’s a key reason why most strategic plans look nearly identical year after year. 3. New capabilities. Capabilities are the competitively relevant activities your group performs with key resources. Basically, what you do with what you have. Too often, activities change only as a reaction to a new activity by a current competitor or new entrant. A recent study I conducted with more than 600 talent development leaders showed that the #1 strategy challenge their organization faced was “Being reactive and tactical.” Think about your group: how often are you proactively creating and delivering innovative new initiatives versus reacting to what competitors are doing? Diet: An effective way to determine which new capabilities will help you win more business from customers is the value chain. The value chain is a breakdown of the key activities and resources you possess relative to other players in the market. The intent of the exercise is to determine where there are untapped or new opportunities to apply resources that create new value. 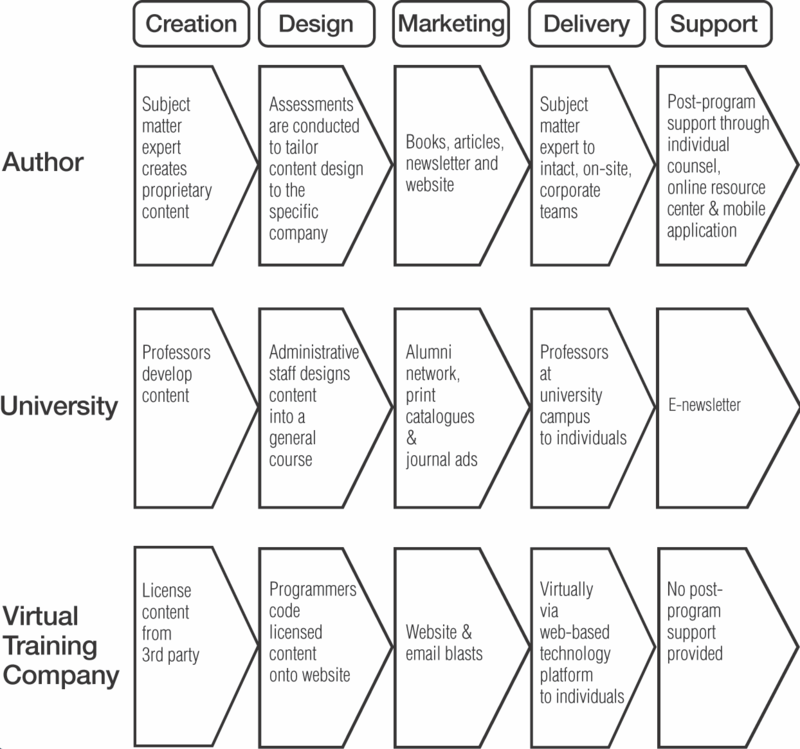 In the following example of a value chain for several types of players in the executive education market, you can see that there are different activities that can be used to carry out the same function (e.g., creation, design, marketing, etc.). A strategic value chain will identify where the business has unique resources that can add superior value to a specific group of customers and then leverage the capabilities to execute on those advantages. Some will argue that the only thing you need to feed the business is new customers. The surest way to secure profitable new customers is to continuously nourish your business with new insights, new conversations and new capabilities. For those not interested in doing new or different things, they can certainly let sleeping dogs lie. But, fail to feed your business and you too may wind up in the doghouse.